Taraka could see Cyrus waiting as he and Gaster approached the monastery on Khalimuck. Upon spotting the two members of his crew, the Maverick’s captain walked over to them. “You certainly took your time getting here,” Cyrus said to the pair. “I certainly do,” Cyrus replied, chuckling. “Axel not coming?” he then asked. “He said he had some things to take care of and told us to go without him,” Taraka informed the captain. “Typical,” Cyrus said. “In that case, shall we?” The Maverick’s captain motioned toward the monastery as he asked the question. “Indeed,” Taraka said with a nod. The trio walked through the monastery’s small front garden, passing by a few meditating monks, and approached the door. Upon entering, they were greeted by a familiar face. “Ah, Taraka, it is wonderful to see you again,” said Kailash, the friendly older monk who ran the monastery. “And you as well,” Taraka replied, bowing his head in respect. “What brings you back to us, my friend?” Kailash asked. “We need your help again,” Taraka told the older monk, taking a look around the room as he did so. He saw some monks that had been here on his last visit, as well as many new faces, but there was one monk in particular whose absence Taraka noticed. Samir, the monk who had proven himself very helpful to Taraka and the rest of the Maverick’s crew, was nowhere to be seen. “Do you know anything about someone that is collecting artifacts from ruins in this region of the Outer Rim?” Gaster asked. “Specifically, taking certain items while leaving others of clear value behind,” Cyrus elaborated. “A pleasure to meet you,” Taraka said, nodding at Gilgamesh. “Likewise,” Gilgamesh replied, reciprocating the gesture. “I shall leave you two to meditate,” Kailash said before taking his league. Taraka nodded, then walked with Gilgamesh to a quiet corner where they could meditate together. The pair of monks settled down on some floor cushions and sat facing each other. Taraka then placed his holoscroll on the floor between them. “You are fortunate to have a typical scroll,” Gilgamesh said, looking at the scroll. “I still do not know what to make of this one,” he continued, placing his own scroll down. This holoscroll was unlike any Taraka had seen before. It was made up of a single cylindrical piece with one large fragment of psionic crystal embedded in it. “Let us see if we can further that progress,” Gilgamesh said. As the monk spoke, Taraka felt his mind reach out to him. “If you’ll allow it, I can connect our thoughts with my telepathic abilities so that we may unlock your scroll’s secrets together,” Taraka heard the older monk’s voice projected into his own mind. Taraka nodded and signaled his permission through thought as he opened his mind to his fellow monk. The two then closed their eyes and reached out to Taraka’s holoscroll. As he had grown to expect, Taraka saw his initial vision play out. He saw the ancient ruin which he now knew to be the ruins he had explored with his crewmates on the swamp planet called Salvix. He saw the gem glowing with a brilliant blue light, the very one he had recovered from the ruins on Fraxion. He saw the small leatherbound book, the journal he had found in the ruins on Zintau. These had all been documented by his scroll already and their secrets were now contained within. It was the fourth and final element of his vision, the shadowy figure silhouetted by the bright white light he now saw before him, the eluded him. Suddenly, the image in Taraka’s mind began grow clearer. The figure remained obfuscated in shadow, but the blinding light surrounding it seemed to subside enough for Taraka to see. The figure stood in a room that looked different from the ancient ruins he had visited on his pilgrimage thus far. This room did not appear to have crumbled with time and instead seemed to be intact, modern even. Perhaps a workshop or a laboratory, Taraka deduced. Then it was over. Taraka opened his eyes to see Gilgamesh looking back at him. “It would seem your path has become more clear to you now,” Gilgamesh said. “What do you think it means?” Taraka asked. He got the sense that Gilgamesh was quite wise for his age and wished to hear what insight his fellow monk might be able to provide. Taraka once more felt Gilgamesh’s mind touch his own, and the two monks then reached out to Gilgamesh’s scroll with their senses. Taraka was soon struck by a vision. First, he saw complete nothingness, but then a point in space appeared before him. Unfamiliar stars. Unfamiliar planets. As he gazed upon these celestial bodies, Taraka was filled with the sense that a long journey lay ahead. That feeling lingered as the monk opened his eyes. “What do you think they’re talking about?” Cyrus asked Gaster as the two waited on Taraka. “I don’t think guys like us ever will,” Gaster said. The pair fell silent once again and Gaster let his eyes drift back toward Gilgamesh and Taraka. The two monks were getting too their feet now. It seemed that their discussion was now over. “How’d it go?” Cyrus asked as Taraka approached. “I know that I will find my final vision in a modern location,” Taraka answered. “That’s good, I guess?” Gaster said. As the trio turned to leave the monastery, Gaster noticed one of the doors leading to a back room slide open in the corner of his eye. Turning to look, he spotted a familiar face emerge. Gaster locked eyes with Lars Rickets and the two shared a glance of mutual recognition. “Likewise, Mr. Rickets,” Cyrus said, nodding his head at the bounty hunter. “Please, call me Lars.” the bounty hunter said. “So, what brings you out here?” Lars asked. “All we’ve learned is that our employer has gone dark,” Cyrus informed the bounty hunter. “I’m sorry to hear that,” Gaster said. He felt bad for Lars, but he didn’t want to get involved with that assassin again. “Is there anything we can do to help?” Taraka asked. “Well if you find out anything at all, please let me know,” Lars said. “That’s a relief,” Gaster said. He wasn’t keen on actively pursuing the frighteningly powerful assassin they had encountered on Troyva, but he was satisfied that the captain wasn’t directly getting them involved. He was fine with a little snooping on the side. Looking ahead, Gaster saw a grassy hill crowned by a lone tree just off the side of the path. The trio had decided to go a bit further beyond the outskirts of town to find some Pokemon before heading back to the ship and this looked to be a promising spot. “That looks like a good place to look,” Taraka suddenly said, pointing in that direction. The monk, it seemed, had the same thought as Gaster. “Sure, let’s check it out,” Cyrus agreed. Stepping off the path, the trio began ascending the hill, maneuvering around the large rocks protruding from it. Upon reaching the top, Gaster noticed several Pokemon. A Chingling and a Spoink were moving about the area while a Lucario sat meditating on a nearby rock. There was also a white-furred mother Meowstic resting under the tree with her baby Espurr. “I’ll take that Chingling if you don’t mind,” Gaster answered his crewmate. He thought it could make a nice addition to his team if he caught it and trained it up into a Chimecho. “I might have use for that Lucario there,” Cyrus then chimed in. “I shall help you catch them,” Taraka said. The monk took a step forward then tossed out his Carvanha, then Cyrus sent out his Victreebel. Gaster followed suit, sending out his Banette, which had evolved shortly after the debacle on Troyva. “Clara use Curse on that Lucario,” the former smuggler commanded his ghostly Pokemon after assessing the battlefield and determining it to be the greatest threat. After Clara worked her magic on the Lucario, which involved expending her own energy, Taraka approached the Banette and used his psionic healing abilities to revitalise her. The monk then glanced back at Gaster and gave him a thumbs up. Acting to protect her baby, the Meowstic moved in to attack the hostile new Pokemon that had appeared. 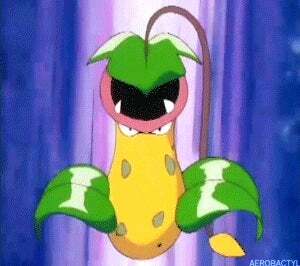 The feline Pokemon darted up to Cyrus’s Victreebel and swiped at her with a sharp claw, causing the poisonous plant to flinch and curl up. “Not so fast,” Taraka said. “Lechew, Bite that Meowstic!” His Carvanha sprang at the Meowstick and took a nasty bite, drawing blood. The monk then moved to engage the Pokemon himself, but it was at this moment that the Lucario launched a blast of Psychic energy at Clara. 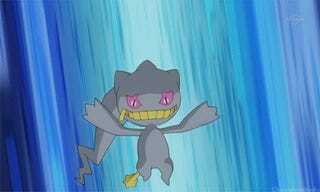 Taraka quickly changed direction and put himself in the line of fire, shielding the Banette beside him from harm. “Thanks,” Gaster told the monk, appreciating his bravery. “No problem,” Taraka replied, giving the former smuggler a nod. “Clara, hit that Chingling with Will-o-Wisp!” Gaster then commanded his Banette, seeing his target move in to engage. He then tossed a Pokeball at the injured Meowstic, figuring he might as well try to capture it and get it out of the way. The Chiningling managed to evade Clara’s attack, but the same could not be said for the Meowstic. The psychic feline was held in place by Lechew’s jaws. As the Meowstic struggled against his powerful jaws, the Carvanha began to glow. Gaster’s ball then made contact and pulled the Meowstic in, causing the jaws of the newly evolved Sharpedo to snap shut on empty air. Freaking out over the sudden disappearance of its mother, the baby Espurr ran at Lechew and let out a piercing cry. It was a cry that sent out a pressure wave in all directions. Taraka’s Sharpedo, which was right next to it, was knocked back a bit, but seemed otherwise fine. “Strike back with Ice Fang!” Taraka responded to the attack. Lechew sprang at the Espurr and gave it a nasty bite, teeth frozen over with ice. The monk then quickly threw a Pokeball at the Espurr, capturing it instantly. Now both mother and baby had been caught. Before Taraka could collect his prize, the Lucario dashed at him wielding a bone-shaped staff of pure aura energy. It struck swiftly, landing four successive hits before the monk managed to blast it with a Will-o-Wisp and stagger it long enough for him to get out of harm’s way. “Nepenthe, hit it with Sleep Powder!” Cyrus commanded his Victreebel as Taraka moved to safety. The captain’s Pokemon spewed out a cloud of powder at the Lucario, but the aura Pokemon dodged out of the way. “Clara, use Shadow Claw!” Gaster commanded his Banette before taking aim at the Lucario. As Clara moved to strike, the Lucario parried her attack, then leapt away, evading the laser shot from Gaster’s rifle. Landing on its feet, the aura Pokemon fired a blast of psychic energy at Clara, doing a real number on her. “Now, Stun Spore!” Cyrus ordered. His Victreebel sprayed out another dust cloud at the Lucario, this time hitting the mark. The immobilizing powder left the Lucario open and the Maverick’s captain seized the opportunity. Cyrus threw a Pokeball at it, but unfortunately, it broke free. Before the Lucario could make another move, Gaster threw a ball of his own at it. This time it did not break out. “All yours, Captain,” Gaster said, nodding at his employer. 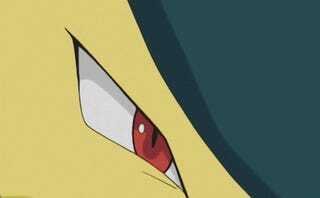 With the Lucario dealt with, the trio shifted focus to the Chingling next. Taraka had his Sharpedo attack, then Cyrus had his Victreebel put it to sleep. “And this one’s all yours,” the captain told Gaster, the Chingling now in the perfect condition for a capture. One Pokeball toss later, another Pokemon was captured. Now only the Spoink remained. It soon proved to be another easy capture. One bash from Taraka’s staff and one Will-o-Wisp from Clara was all it took to weaken it enough. 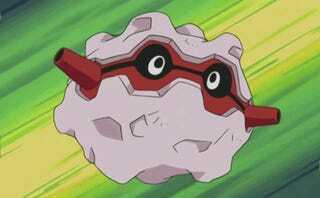 Taraka then procured a Pokeball from his bag and tossed it at the Spoink, catching it instantly. “Well, that was fun,” Gaster said as he walked over to collect his new Chingling. “Thanks for the assist,” Cyrus said before tossing Gaster a Great Ball to replace the ball he’d used to catch the Lucario for the captain. The sun was starting to go down as Cyrus, Gaster, and Taraka neared the monastery once more. Taraka was in a particularly good mood, having just captured two new Pokemon and evolved his Carvanha. The monk quietly hummed a tune to himself as he and his crewmates walked along. As they passed the entrance to the monastery’s front garden, Taraka spotted Lars sitting with his back against the fence, looking up at the sunset. “You alright there, friend?” Taraka asked, approaching the bounty hunter. “I’ve been better,” Lars replied, lowering his gaze to look the monk in the eye. “Perhaps a Pokemon battle?” Taraka offered. “You know, I think I could use a good battle to take my mind off things for a bit,” Lars said, getting to his feet as he spoke. “Sounds like fun,” Gaster said, joining the pair. “You in, Captain?” he then asked, glancing back at Cyrus. “Alright, see you later, Captain,” Taraka said. “Works for me,” Gaster said. “I have no issue with this either,” Taraka agreed. “Bring it on,” Gaster said, grabbing a Pokeball off his belt. Taraka grabbed one off his belt as well, that of the Espurr he had just captured. Lars tossed two of his Pokeballs up into the air as Taraka released the Pokemon and Gaster sent out his gloom. A Rapidash and a Forretress emerged from the balls Lars threw, and the battle was on! “Comet, use Flamethrower on that Gloom!” Lars issued the first command of the battle. 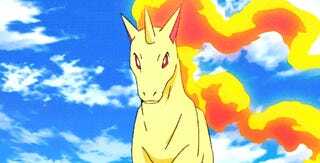 His Rapidash ran across the battlefield to get in range, then spit out a jet of flames at Gaster’s Pokemon, doing a real number on her. Seeing this, Taraka knew their Pokemon needed some protection. “Kato, use Light Screen!” the monk commanded his Espurr. “Broadside, use Take Down on it!” Lars ordered his Forretress while the Espurr put up a protective psychic barrier. The bounty hunter’s second Pokemon rolled up to Ficus and slammed right into her, but she managed to hang in there. “Ficus, use Stun Spore on that Rapidash!” Gaster commanded his Gloom. Ficus shot a burst of immobilizing powder at Lars’s Rapidash, then Gaster recalled her and sent out his Typhlosion. With the Rapidash stunned, Taraka commanded his Espurr to move in. “Kato, use Psyshock on that Rapidash!” The psychic feline moved up on the Rapidash and fired off a blast of psychic energy, landing a good hit. “Comet, counterattack with Flame Wheel!” Lars quickly ordered the fire horse in response. Surrounding itself with flames, the bounty hunter’s Pokemon rushed Kato, landing a good hit of its own. “Broadside, use attract on that Typhlosion, keep it from hitting you!” Rolling up to Gaster’s Typhlosion, the Forretress released pheromones from its cannons, causing Rusty to become infatuated with it. “Damn it,” Taraka heard Gaster curse under his breath. “Alright, if that’s how it’s gonna be, Rusty, use Swift on that Rapidash!” the former smuggler ordered, clearly changing tactics. His Typhlosion let loose a barrage of energy stars at Lars’s other Pokemon, causing it to trip due to the effects of the Stun Spores clinging to its body. “Kato, hit it with Psyshock while it’s down!” Taraka commanded his Espurr, taking advantage of the Rapidash’s vulnerable state. Another psychic blast from the Espurr left the fire horse starting to show signs of weakening. Staggering back to its feet, the Rapidash shook off the hit and prepared to attack. “Comet, use Flamethrower on that Espurr!” The fire horse burned Kato with another jet of flames, but his psychic barrier protected him from the brunt of the attack. “Broadside, use Take Down! Hit that Typhlosion!” Lars commanded. In his infatuated state, Rusty let his guard down as the bounty hunter’s Forretress rolled at him, allowing it to land a good hit. Fortunately this seemed to snap some sense into the Typhlosion. “Rusty, use Heat Wave!” Gaster shouted, reacting quickly. The former smuggler’s Typhlosion spewed out a massive torrent of fire from his mouth, completely enveloping Lars’s Forretress. When the flames had cleared, Taraka could see the Forretress was still hanging on, but it looked much worse for wear. Gaster seemed to hang things under control, so the monk kept his attention on the Rapidash. “Kato, use Psyshock again!” he commanded his Espurr. With one more blast of Psychic energy, Kato brought Comet down. “Not bad,” Lars said as he recalled his fainted Pokemon. “Let’s see how you handle this, though.” With that, the leader of the Red Suns sent out a Pokemon Taraka was all too familiar with. “Redwing, use Fly!” Lars commanded his Salamence as it emerged from its ball. “Broadside, use Self-Destruct!” he then followed up with a second command as Redwing took to the skies. Broadside rolled toward Kato until it was equidistant between him and Rusty, then it exploded, dealing a massive amount of damage to both Pokemon. When the smoke had cleared, Taraka saw that his Espurr was down and Gaster’s Typhlosion was barely hanging on. “Rusty, use Smokescreen!” Gaster reacted quickly. His Typhlosion surrounded himself in a cloud of smoke, a cloud which the former smuggler himself ran into, super potion in hand. Meanwhile, Taraka recalled his fainted Espurr, then sent out his Aerodactyl. It was time for a heavy hitter. “Fels Vogel, use Agility!” the monk commanded the Pokemon while he waited for Lars’s Salamence to move back into range. “Time to strike, Redwing!” Lars called out to his dragon Pokemon. “Take out that Typhlosion!” His Salamence swooped down from the sky and into the smoke. The smoke proved to be a saving grace, obscuring the Salamence’s vision enough to allow Rusty to avoid its attack. Redwing passed right through the smoke cloud and right into the path of Taraka’s Aerodactyl. “Fels, use Ancient Power!” Taraka commanded. The two large, winged Pokemon rapidly traded blows as fast as their trainers issued their orders. Within a few seconds, both Pokemon had severely worn each other down. “Time to end this, Redwing! Use Thunder Fang!” Lars shouted. Mouth sparking with electricity, his Salamence sank its teeth into Fels Vogel’s rocky hide, bringing him down with a super-effective strike. “Now, strike again! Use Dragon Tail on that Typhlosion!” Redwing quickly spun around and swiped its tail through the smoke cloud, just narrowly missing Rusty. “Rusty, use Swift!” Gaster commanded his Pokemon in response. Another barrage of energy stars came flying out of the smoke, pelting the Salamence. “Finish it with Iron Tail!” Lars ordered. His Salamence brought its tail crashing down on Rusty, taking him down, but not without sustaining a nasty burn. “It’s all up to you now, Ficus!” Gaster called out as he sent his Gloom back out. In her weak state, Taraka doubted she would do much against Lars’s Salamence. Ficus ended up not being able to do anything. With one strike, the Salamence brought the Gloom down. The battle was over. Despite losing, Taraka smiled back at the bounty hunter. “We try,” the monk said. “Don’t mention it,” Taraka said. Notes: Whew! This chapter ended up being longer than I thought. There wasn’t really a way to split events up in any other way that made sense though. This chapter covers the events of the second half of session 36 and the first half of session 37. That was the best way to organize things. The monastery scene was a lot shorter in game, with a fun little cameo. If you’ve read the original series you’ll recognize Gilgamesh. He’s much younger here and hasn’t even finished his first pilgrimage yet! I expanded this with a lot more detail for the writing and I think its one of my favorite moments in Frontier yet. I also threw Lars at them again to advance some plot stuff. 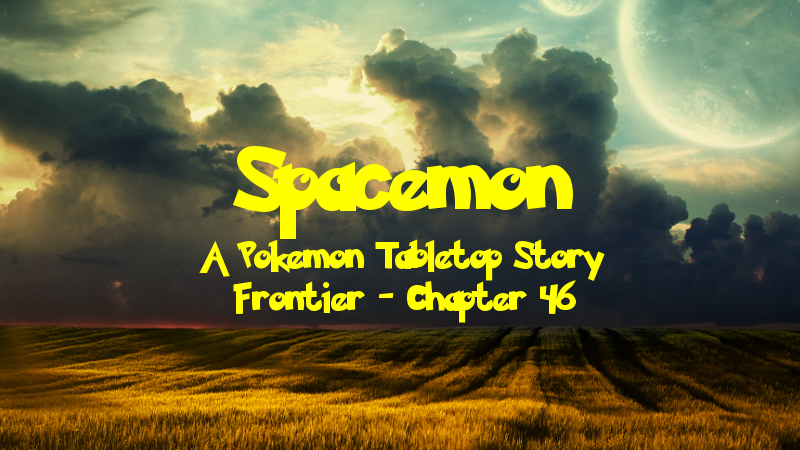 After that they went looking for Pokemon on the planet for the rest of the session, which was a shorter one as I mentioned last chapter. The first thing they did the following session was ask to battle some trainers. I decided to make things interesting and had them battle Lars. It was a fun battle, and a close one too. His Salamence was very near fainting at the end, but it hung in there and delivered the party a rare defeat. Post-Chapter Challenge: It’s time for some more theorizing. We got to see some new details about Taraka’s vision and an entirely new vision for Gilgamesh. I’d love to hear your thoughts on what you think these visions mean, that is if you don’t already know. TAY: Open Forum - I Guess?